I've previously documented the ska and reggae pasts of many major pop and rock stars, including Madonna, Trent Reznor of Nine Inch Nails and Eddie Vedder of Pearl Jam. While these icons dabbled in ska or reggae before going to make their mark in dance pop, industrial and alternative rock, George Michael actively pursued a career as a ska musician before going on to find success in Wham and later as a solo artist. 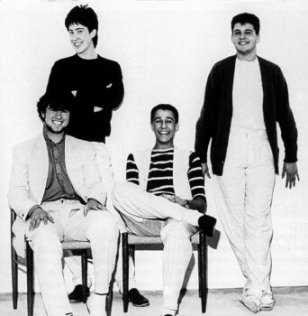 Michael and his best friend Andrew Ridgely formed their 2-Tone influenced band The Executive (rare band photo above) along with Paul Ridgely and David Austin in 1979. The band banged out happy, sunny syncopated 2-Tone styled ska and later entered a a sixteen-track studio to cut a demo tape, recording an original titled "Rude Boy" plus a ska cover of the old Andy Williams' classic "Can't Get Used To Losing You"and a ska version of Beethoven's "Für Elise." According to a George Michael fan web site, the band played local gigs close to where they lived and spent a lot of time hawking their demo tape around the A&R departments of London-based record companies. Rumor has it that a copy even made its way to Dave Wakeling of The Beat who were running their own Go Feet label in Birmingham. "George and Andrew would take time off from school and college, travel to the capital and then sit around in the waiting rooms of the music business until some lethargic talent-spotter finally agreed to see them. But even when they were granted an audience, the A&R man who lolled in his chair on the other side of the desk invariably pressed the STOP button before their tape had gone very far. 'Come back in the next millennium,' seemed to be the general consensus among the major labels, thought Andrew, and even those sympathetic to the ska cause failed to offer them anything resembling a deal. Andrew was cocky enough to attribute the negative response of the record companies to the advanced ages and modest IQs of the men who staffed the industry's A&R departments. George was confident enough to think that perhaps "Rude Boy" was sufficiently derivative to deserve all the rejection it had heaped upon it. He would do better next time..."
Though they lasted only 18 months, Michael and Ridgely ended up using the constant A&R rejection of The Executive to start over with Wham. 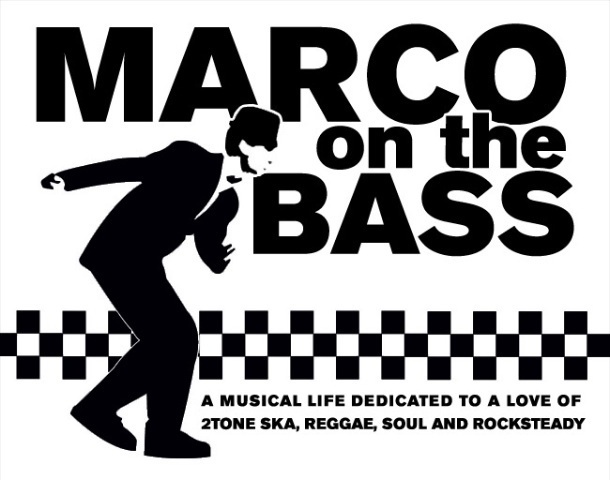 The truth is that The Executive was part of the many copycat ska bands that popped up all over the U.K. during 1979-1980 in the wake of The Specials, Madness, The Selecter and The Beat's ascent into the charts and on Top Of The Pops. And while many of those bands are forgotten to the sands of time, the fact that Michael made it big as a pop star has fueled interest among ska enthusiasts to locate and hear the songs on the elusive and impossible to find demo tape. Despite my best efforts, I think it's safe to say that we're never going to hear The Executive demo. My understanding is that it was not actually released and there were less than 10 copies made. Each time George Michael would go to a major record label he would specifically make a copy for that label. The first tape had only three songs -- "Rude Boy," "Can't Get Used to Losing You," and "Fur Elise" -- but subsequent tapes would include a newly added song until there were eventually 6 to 8 songs (depending on who you ask). The song "Rude Boy" was written by George Michael but "Fur Elise" was just a ska version of the classical song, and I'm guessing that they saw The Beat perform "Can't Get Used to Losing You" live and saw the potential for a hit. The Executive recorded it before The Beat did and if they had pressed it to vinyl they might have had a successful career as a ska band. I have heard (and I'm not saying it's true) that the first recorded version of "Careless Whisper" was added to one of these tapes. It was recorded with Jerry Wexler at Muscle Shoals studios in 1981. It did have a bit of an upstroke on the guitar. Certainly not a ska song, but it sounds like they were playing in a style comfortable to them. How much of any of this is true I don't know. I do know that it has never been on eBay. If it ever does end up on eBay it will go for several hundred - if not thousands of dollars. George Michael fans can be unreasonably devoted to all things George. Ska fans, not so much. I imagine there is a store bought tape with the words 'The Executive' in faded marker in George Michael's own handwriting sitting in a dusty box in the basement of a failing record company. It will be destroyed in a few years when the business is shut down. Nobody will ever hear it again. And that's just as well. From what I hear it was not very good. Despite the fact that The Executive may not be very good, hearing their long lost demo tape remains a goal of mine. If you've heard it or might be one of the very few people who have a copy, please let me know. hahaha LOL for the day! another beautiful story. Probably much more beautiful than the Executive demo tape. I would love to listen to the tape, too, though. Never knew George started out in a ska band. With his passing, that first demo now has historical significance. Good or not, it would be an interesting listen.